St Mary's Catholic School began in 1986 and was built in three stages. The present Kindergarten, Year 1, 2 was stage 1 the present Year 3, 4 and administration block was stage 2 and the present Year 5 and 6 block was stage 3. 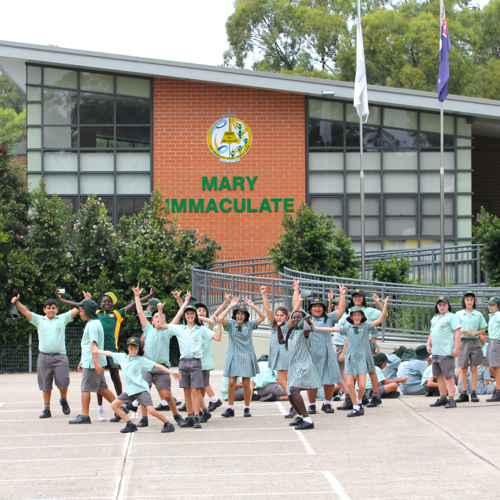 St Mary's school has a Marist tradition with a great devotion to Mary as the Oblate Fathers' serve the parish of Mary Immaculate Eagle Vale. Mrs Marie Debusch (1993-1996) was the first lay Principal. Mrs Luisa Tobin assumed Principalship from 1997-2012. Mr Don Spencer is currently Principal. On December19, 1999 Bishop Philip Wilson officially opened our new Parish church. In 2005, Bishop Peter Ingham decreed that our school name would change from St Mary's to Mary Immaculate Parish Primary School. This change will further strengthen our strong ties with the parish. Hence, our new school logo which reflects a merging of the Mary Immaculate parish logo and the previous St Mary's logo.